August 29, 2014 — EVANSTON, ILL. — They toss their maces into the air, squinting against the sun. In perfect form, Drum Majors Elisabeth Sladek '16 and Emily Liquin '16 catch the heavy bits of spinning metal and march on. They, along with the rest of the Northwestern University 'Wildcat' Marching Band, are putting the final touches on tomorrow's debut performance of the fall 2014 season. "Doing the backbend in front of that many people is going to be pretty nerve-wracking though," says Liquin, who was appointed to the podium in April. Saturday will be her first full field performance. 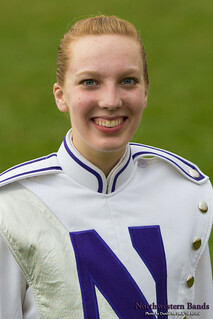 Her mace-wielding partner, Sladek, returns for a second season as drum major. She is reflective on the experience. "Over the past season I have learned how truly important NUMB is to the Northwestern community," says Sladek, who has moved to the School of Communication to study communication studies. 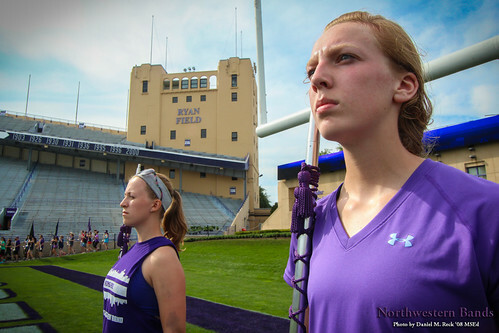 Both drum majors are in their third season with the Wildcat Band. "(Elisabeth) and I came in together as freshmen in the flute section, so we already know each other very well," says Liquin, who studies cognitive science in the Weinberg School of Arts and Sciences. Though they started together, and even auditioned together, they took different paths to the leadership of the band. "The most challenging thing about the audition process was doing it all again!" says Liquin. "I auditioned for drum major last year, but wasn’t chosen." Still, the former high school drum major from Palatine, Ill., was persistent. "I have NUMB to thank for most of my close friendships," she says. "I think keeping a positive attitude and really dedicating myself to my goal of being drum major was very important" Liquin says. "Not being chosen last year just made me work harder this year." Sladek, who hails from Crystal Lake, Ill., welcomes her classmate. "I am looking forward to collaborating with Emily on new ideas and continuing to lead by example through dedication, passion, and (pride and guts)," says Sladek. "My advice to Emily is to be confident, be yourself, expect the unexpected, and most importantly, enjoy every moment," says Sladek. "It is a lot of hard work but completely worth every minute." "I think we’re going to be a great team," Liquin says. The Wildcat Football home season kicks off tomorrow when they host California. Fans may find Wildcat Football on Facebook and on Twitter as @NUFBfamily, they also find Head Coach Fitzgerald on Facebook and Twitter, Be sure to also follow Twitter hashtag #B1GCats for the latest Wildcat athletics action. 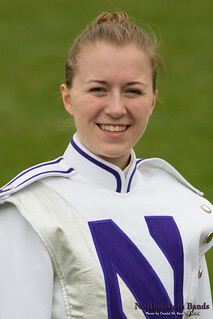 As usual, the Wildcat Band will tweet from @NUbands, and will be posting on Facebook, Google+, Flickr, and Tumblr. Videos of band performances appear on YouTube.